Zucchini is delicious raw, especially when it is marinated before being added to a salad. Many of the zucchini recipes I’ve shared here on the blog have been made with cooked zucchini, but zucchini is equally as delicious raw, especially when it is marinated before being added to the salad. First, slice the zucchini into very thin slices. I use this mandoline slicer. I love this simple tool for cutting up thin strips. As you can see in the pictures below, the food holder on the mandoline protects your hand from the blade while you slice. I also often use this cut protection glove (not pictured) which really helps protect fingers from getting nicked. The middle picture is a view of the back of the mandoline where you can see where the slice comes out. Once you have sliced up the zucchini, place all the slices in a shallow baking dish with the lemony marinade for at least two hours. Just before you’re ready to serve your salad, finish prepping your ingredients. Cook the bacon and drain on a paper towel. Toast your pistachios in a small pot in sizzling garlic butter. Slice up the red onion (I used the mandoline again to make evenly thin slices). Drain the zucchini and discard the marinade. Now here is the fun part. Roll up each slice of zucchini and divide among four plates. Arrange the slivers of raw red onions atop each plate of zucchini. Raw onions are so good for you. You can read more about the health benefits of onions here. And they add such pretty swirls of color. Next, sprinkle with crumbled goat cheese. It adds a lovely creaminess. Because goat’s milk is closer in comparison to human milk than that of a cow, some people with low tolerance to cow’s milk can tolerate goat’s milk. Read more about goat cheese here. The goat cheese I used is a Chèvre from the Vermont Creamery. This is a wonderfully tasty cheese. Vermont Creamery proudly states that their goats’ milk comes from high quality, sustainable, and environmentally sound farms. It really turns this salad into something special. After the goat cheese, top the salad with toasted pistachios. I love the buttery crunchiness they add to the salad. (If you’re concerned about nuts manufactured on shared equipment with gluten containing products, Nuts.com prominently labels which products of theirs are certified gluten-free). Now for the chopped bacon. I’ve always recommended no nitrate bacon, and lately I have been using sugar free bacon from U.S. Wellness Meats. You may be able to find sugar free paleo friendly bacon at your supermarket. Finally, add a handful of Kalamata olives to each plate. They’re good for you too. There you have it: a delightful summer salad with super healthy ingredients. I think this salad is delicious with a very light vinaigrette. For the vinegar, I used Bragg’s apple cider vinegar. It is one hundred percent gluten free and one hundred percent nourishing to your body. Raw apple cider vinegar has a host of health benefits from improving digestion to alleviating heartburn to maintaining healthy skin. It alkalizes the body, balancing your pH, to help you fight off disease and inflammation. I especially like Bragg’s because it contains the “mother” of the vinegar: strands of proteins, enzymes, and friendly bacteria. To soften the sharp taste of the apple cider vinegar, I mix it with a little olive oil, garlic, Dijon mustard, and lemon juice. Some tips about olive oil! To be sure that you’re buying a high-quality olive oil, look for an extra virgin olive oil (EVOO); otherwise, it has been chemically refined. For the freshest olive oil, check the harvest date on the label and make sure it is within one year. The oil should come in a dark glass bottle and be stored in a cool, dark cabinet. With the vinaigrette made, we’re ready to dig in! John and I couldn’t resist adding extra slivers of red onion and a little more bacon to our salads. I can’t wait for you to try it. I hope you have an opportunity to slow down and enjoy this fun salad with family and friends. What are you most looking forward to these upcoming months? Enjoy! Have a happy and healthy week! Marinate zucchini: Slice zucchini into thin strips using a mandoline and place zucchini in a shallow baking dish. Add olive oil, lemon juice, salt, pepper and garlic to a small bowl and stir. Pour marinade over zucchini, cover and place in the refrigerator for at least 2 hours. When you are ready to assemble your salad, Toast Pistachios: Heat butter in a saucepan over medium heat until it bubbles and begins to brown. Turn off the flame and add garlic and pistachios. Stir well to coat the pistachios until slightly toasted. Assemble Salad: Drain zucchini and discard marinade. Roll each slice of zucchini and divide zucchini among 4 plates. 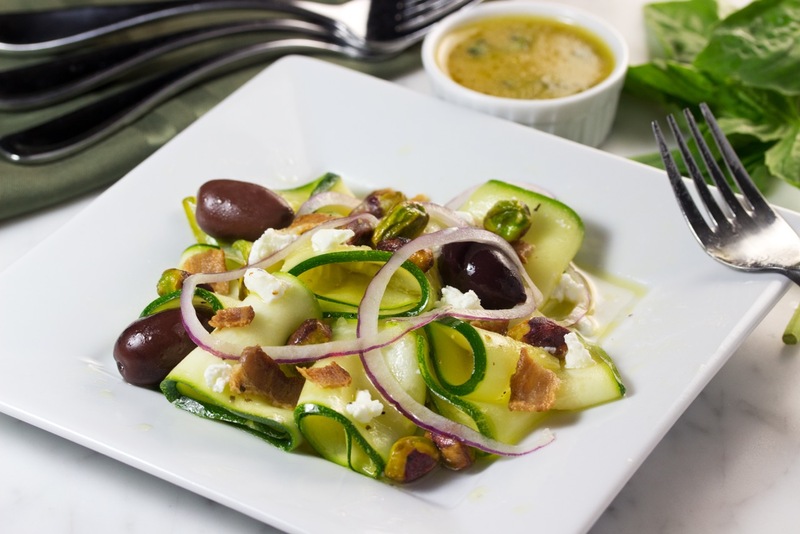 Top each plate of zucchini with slices of red onion, toasted pistachios, olives, bacon and goat cheese. For vinaigrette:Whisk together in a small bowl: olive oil, vinegar, basil, dijon mustard, garlic, salt, and pepper. Drizzle over salad as desired. Allow 2 hours for marinating zucchini in the refrigerator before assembling your salad. Thanks so much, Michelle. I hope you love it. Sound and looks like a healthy and tasty salad – perfect for summertime heat when you want sometime tasty and filling but not too heavy. I love how you sliced your cucumber. I am going to try that myself. Thanks for sharing on Real Food Fridays. Pinned & tweeted! Hey Barbara – what a gorgeous salad! So delicious. I would have never thought to marinate zucchini. Brilliant! The bacon is a great twist that might convince my littler boys to eat this! Have a beautiful weekend! Hey Allie, Thanks for taking the time to stop by and then to leave your comment. This looks like my sort of salad (well maybe not the onions, I’m not a fan of raw onions). I’m definitely going to pin this to try. I think this would make a wonderful weekday lunch. Thanks Diana. I hope you both love this. Yum! That sounds just perfect for a light dinner on these hot days! A few months ago I found out that I’m allergic to squash but I bet your salad would be just as good made with cucumber instead of the zucchini. Going to try it soon! Beautiful zucchini ribbons! I also love the addition of kalamata olives. I just returned from Greece and have a whole supply of olives I picked up there, this would be a wonderful way to use them. There you go, Alyssa. This is perfect. Thanks so much for taking the time to stop by and to leave your sweet note, Misty. I hope you love this as much as I do. Such a beautiful salad. Love zucchini ribbons! Thank you so much for sharing this delicious dish on Simply Natural Saturdays. I’ll be featuring this post tomorrow – looking forward to what you’ll be sharing this weekend. Hi Krissi, I hope you love it as much as I do. Hey Claire, Thanks for you sweet words! Oh thanks, Emma. Have an awesome weekend. I LOVE how yummy and healthy this recipe looks. Totally something I’d try! Obsessed with pistachios! Love that they are in this! Oh boy, yes! Me too. And they add a nice crunchy touch to the salad. So yummy and healthy too. Love this. Pinning! Thank you, Maggie. 🙂 Thanks for pinning. My dude is going to love this. He’s developed a zucchini noodle obsession. Hi there, this look delicious. Yum!! Pistachios are some of my favorite nuts to use in salads! This looks amazing! Me too. I love pistachios in a salad. I’m so happy I just saw this. Did you enjoy the salad? It’s one of my favs.